This is the third part of a series dedicated to everyday life on Saint Kilda. Today’s article is about an Hirta’s unique political organisation. Now it is time to talk about a major component of life in the north of the world. History books speaks much of Athenian democracy as the origin of many principles which still guided our Western societies. Today many question the representativeness and legitimacy of elected politicians and there is a crisis of confidence in government managers. There is concern about the apparent limits of capitalist democracies, poisoned by abstention and a lack of dialogue between the different social strata. On the other hand, not much is offered in the way of alternatives and solutions. Did you know that, on Hirta, the community has been living in a sort of “pure democracy” (ignoring anyway women like in the Athenian democracy) with considerable simplicity? How did the system work? Until the evacuation in 1930, the archipelago was effectively independent politically from the rest of the United Kingdom. In a very institutionalized Europe, this tiny archipelago survived, ruled by its own laws, in a manner approaching a primitive communism, a “utopian society”, anomalous in the wider political landscape. In 1838, the English Georges Clayton Atkinson stayed in the island to observe the curious government in place on Hirta. Until then, he had never seen such a thing! 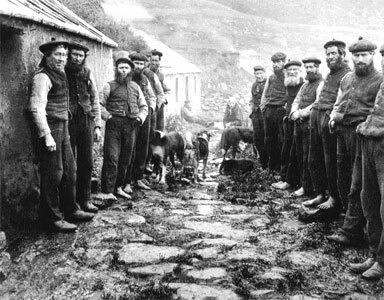 Much of the time before the start of the day, the island men would meet in the unique street of Bàgh a Bhaile in order to decide together, the daily activities. During this meeting, they talked about the work done the day before and decided what came next. On this occasion, they formed working groups according to everyone’s wishes, sharing the tasks necessary for the group to survive. Some of them might hunt birds on the cliffs, others might maintain the cultivated lands and the livestock for each other. Women were usually expected to take care of home, children, and work the wool. They helped maintain the cultivated lands as well. Atkinson spoke of those meetings as “the daily Parliament of St Kilda”. However, we cannot compare it to a parliament because of its singular functionality. The “daily Parliament” in a street of the village, 1928. This daily “parliament”, a gathering of adult men, was managed by no one in particular. Everyone has the right to speak. When one Hirta man speaks, other ones listen and discuss. There is no boss, no president, and no master of sessions. It is a real self-management in which all men are equal. According to Tom Steel, author of “The Life and Death of St Kilda”, ‘the discussions often lead to disagreements, but there is no confirmation in History that quarrels were so violent to cause a permanent split in the community.” Indeed, the need for conciliation, in order to live together on the island is essential. This is maybe the reason for success of the local political functioning which ultimately knows only its own laws. The continent and its institutions are far off and abstract. Tags: daily Parliament of St Kilda, Life was beautiful on the island, primitive communism, St Kilda history, utopist society. Bookmarquez ce permalien. Previous post ← Is there any spirit there? Well. That is again citing somebody without questioning if it is really based on deep knowledge. Donald John Gillies – who lived on St Kilda and was raised there – later stated about the parliament: « … so there was more of a specultaion or assumption that what they wrote was its function ». He says that to his memory none of the writers ever took place in a parliament nor was the parliament « daily ». There were many times and occasions without meeting in the morning. During sheep shearing, harvesting or peat cutting for instance never has been parliament. And that was about ten days each at least. And he says, there were many more times. So one could at least question if it happened that way. All these Info are taken from « The Truth About St Kilda, An Islander’s Memoir by Donald Gillies » page 19f. Thank you for the information. Well, I think that’s very interesting. On the other hand I did not say that these meetings were daily. I simply said that the meeting took place « much of the time ». Yours faithfully. If « There is no boss, no president, and no master of sessions. It is a real self-management » is this not more akin to an anarchy that primitive communism?